The Eagles as they look today. Nearly a month late (apologies), here’s a list of my favourite half dozen underrated Eagles songs. 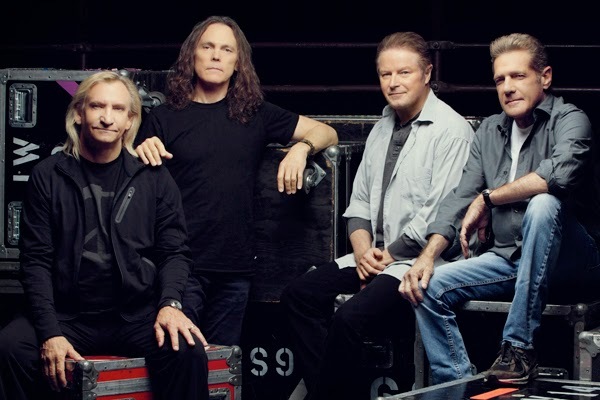 I saw their first of two concerts in Auckland last month and while in part it was everything you’d expect from an Eagles show – perfect harmonies, precision of performance etc – there were some unexpected deviations. For starters, Joe Walsh is a weird and wonderful loose counterpoint to the tightness of Don Henley and Glenn Frey. The melodies and harmonies are the stars of an Eagles concert, but the charismatic, eccentric, real, flawed and brilliant musician that is Joe Walsh is a close second. Other than the surprise of just how much I loved Joe Walsh in a live setting was the joy of seeing original lead guitarist Bernie Leadon who is currently touring with the band. Leadon’s presence has caused me to reassess his role in the earlier years of the band and a quick check of writing credits reveals he was much more than just a tag-along to the more dominant, more famous forces in the band. The Last Resort is Henley’s magnum opus on the perils of commercialization and over-development, told through the lense of an American history lesson. The band themselves have downplayed the song, claiming it was never fully-realised musically, but from the first time I heard it as a kid until now as an adult, The Last Resort always gets me. “You call some place paradise, kiss it goodbye,” is so depressing and yet so beautifully sung. Stunning. “I’d try any ill to find the cure,” is a great, wayward-youth encapsulating line. From the band’s underbought second album, this is a quietly enchanting song with strong harmonies and subtle guitar lines. The lead acoustic finale is short, but long enough to thrust Bitter Creek as a contender for being Leadon’s finest moment as an Eagle. To this day I get the feeling no-one really knows – not critics, fans nor the Eagles themselves – what to make of The Long Run, the album that effectively broke up the band for nearly 15 years. The album that took an impossibly long two and half years to make, that produced three US top 10 hits and sold millions, is staunchly unloved. Or is it? Fans openly melt in concert over the blue-eyed soul of Timothy B. Schimdt’s US #8 I Can’t Tell You Why, the fun singalong of Heartache Tonight hit US #1 and even the somewhat boring title track made the top 10 (also peaking at #8). So what was the problem? Maybe the combination of being so overdue and therefore an inevitably anticlimactic Hotel California followup, plus the presence of a couple of shockingly sub-par tracks like Teenage Jail and The Greeks Don’t Won’t No Freaks, is the answer. And yet the notion that The Long Run was three hits and nothing else should be chucked out when re-listening to King Of Hollywood. This is moody, R&B-inflected Eagles at their very best. “Still his jacuzzi runneth over” is my favourite line in this spooky Henley-sung warning of the phony ego-boosting ways of Hollywood agents and managers. Tom Waits may’ve written this morning-after / car love song, but the Eagles own it as soon as those magical Frey-led harmonies hit on the lines, “And now the sun is coming up, I’m riding with lady luck, freeways, cars and trucks…” I still can’t believe Ol’ 55 wasn’t a single. Already Gone was the other (minor) hit from On The Border, predating what the group must’ve thought or hoped was a dark horse, the belatedly released US #1 Best Of My Love. But where Already Gone has a generic sort of upbeat country / rock sensibility that makes it solidly forgettable, Ol’ 55 has a melody + harmony combo so gorgeous as to make it the Eagles great what if. What if this had been a single? Maybe not a #1, but if released after the sonically similar Best Of My Love, I’m sure at least a top 10. While the band didn’t perform My Man nor the aforementioned Bitter Creek at Mt Smart stadium last month, they did do another very pretty, largely forgotten Bernie Leadon Eagles song Train Leaves Here This Morning. Hearing songs like this re-whet my Eagles back-catalogue appetite and I returned to 1974’s My Man for the first time in 20 years. A quick Google search revealed this overlooked song is a touching tribute to Bernie’s then recently deceased mate Gram Parsons, best known for his lead role in the Flying Burrito Brothers. Gram didn’t sell a truckload of records in his brief 26 years, but he has long been regarded as one of the most influential American songwriters of his era. Gram’s pioneering ability to marry folk, pop, rock, soul and country has retrospectively opened people’s ears to his influence on bands like the Eagles. From the double LP Long Road Out Of Eden – the only full Eagles’ studio release since 1979’s The Long Run – Waiting In The Weeds could be about the band itself: “I’ve been biding time with the crows and sparrows, while peacocks prance and strut upon the stage.” Are the mentions of other birds in reference to how this most iconic of American bands, as named after their country’s national bird, took a step back in the 1980s while other acts who were all show and no substance pranced and strutted in their place? Possibly, but I choose to think of this song as a broken-heart story. The lyrics tell a tale of seasons changing and a love that slowly breaks apart. But just as seasons change for the worse, don’t they come around again for the better? The singer still loves the girl he lost, believing if he waits long enough she’ll leave the more exciting man she’s with – “the darling of the chic, the flavour of the week” – and return to him. Part of the quintet of outstanding six-minute plus Eagles epics (the others being King Of Hollywood, Hotel California, The Last Resort and Lyin’ Eyes), the melancholy of the words is matched by the music for a song that was rightfully nominated for a Grammy (Best Pop Performance By A Duo Or Group With Vocals).